After setting the tone as the top daily fantasy site in the world, DraftKings has turned its attention to mobile sports betting. The result: One of the best betting experiences in the mobile betting space. DK Sportsbook appeals to both casual and hard-core sports bettors with a user-friendly interface; game odds, props and futures on more than a dozen different sports; and unique bet options like the "Cash Out" feature, which allows bettors to cash out on a bet while it's still live. But the crown jewel of the DraftKings Sportsbook offering might just be the wealth of live betting options available to those who aren't happy settling for standard lines or totals bets. Want to bet on which team will score the most fifth inning runs? Looking to wager on which tennis player will win the fifth point of the second set? DK Sportsbook has it. Depositing is also easy, though only Visa, MasterCard and checking account deposits are permitted at the moment. DraftKings Sportsbook operates through Resorts Casino Hotel, located at 1133 Boardwalk in Atlantic City, New Jersey. Only bettors located within the state of New Jersey can participate in DraftKings Sportsbook, and those who wish to cash out must do so at the Resorts Casino cage; as of now, there is no other way for a bettor to collect his or her winnings. 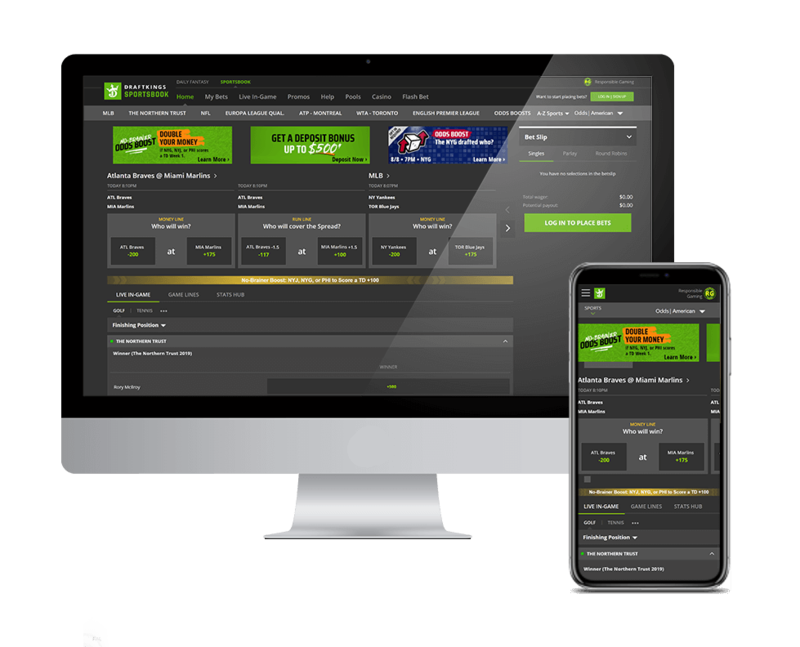 DraftKings Sportsbook offers a typical range of bet types, including spreads, moneylines, totals, and assorted props. But where it really hits is with the "Cash Out" option, which permits bettors to withdraw a wager at any point while the bet is "in action", whether the bettor is in line to win or lose. But beware: DK Sportsbook's vig is, in most cases, higher than the majority of sportsbooks. The online betting interface is simple, almost to the point of being drab – but that's clearly done by design, in order to appeal to beginner users who might be overwhelmed by a more elaborate design. There's also the "Recommended Bet" option, which is sure to be a hit with casual bettors. More advanced wagerers can customize their interface in a variety of ways. While DraftKings Sportsbook is "available" 24/7, those hoping to make a call and end up with a live agent will be disappointed. Your options for live help are to either place a call and ask for a call back, or fill out an online form asking for an agent to reach out. The app does, however, offer a comprehensive help section along with Quickstart Guides. As expected, All of DraftKings' confidential consumer information is safeguarded by SSL (Secure Socket Layer), according to the company website. And according to NJOnlineGambling.com, all legal New Jersey online casinos are equipped with security to rival North America's top tech companies – a safeguard that will almost certainly be extended to online sportsbooks. While most online sportsbooks provide prospective customers with clear upper betting limits, DraftKings has oddly decided against it. "The DraftKings SportsBook does not list limits as they vary based on events, outcome liquidity, odds, time to event etc.," the website reads. DraftKings does accept bets as low at 10 cents.